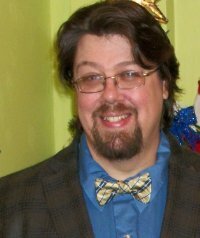 Our interview today is with A. W. Breeden. Thank you for being here today and for agreeing to do this interview. Answer: You write what you know and I’ve always been a sci-fi fan. Those who’ve read my books know that I write cinematically; I basically write the movie in my head. I have a lot of old sci-fi movies running around in my skull for inspiration: classic stuff like Star Wars, Star Trek, Battlestar Galactica, Blade Runner, Total Recall, Terminator, Godzilla kaiju movies… gorgeous films touched by masters like Ray Harryhausen, George Lucas, Steven Spielberg, Ridley Scott and James Cameron. I also devour newer stuff like the Riddick saga and the Marvel comics-based movies. It’s all in there, along with more action flicks than I care to think about. For crying out loud, my favorite Christmas movie is Die Hard. That’s just who I am. So as a rabid fan of action-packed sci-fi, what else would I write? Answer: I’m a vocalist, songwriter, preacher, artist and happy husband. I’m also the father of four great kids with special needs. It’s not always easy, but it’s very rewarding. I was the kid who never quite knew what he wanted to be when he grew up. I considered being a rock star, astronaut, super spy and Indiana Jones, but who hasn’t, right? What I did know was that I wanted to be a dad. My dad made it look so fun and easy, after all. It’s defintely fun most of the time. It goes without saying that my life comes with a few challenges that most folks don’t experience, like finding a church that gives more than lipservice to loving the least of these and educating grown adults on the courtesy of not staring or using the R-word [“retard”], but I wouldn’t trade my kids for all the white-washed steeples in the world. I couldn’t do it without my wonderful wife, who is also my best friend. Obviously, it doesn’t leave a lot of time for either writing or ministry, but I’m not like a lot of other ministers I see out there. I think I realized a long time ago that our God is not Moloch; He doesn’t want us to sacrifice our children on the altar of ministry and service. I think that if more men had the attitude that our families are our primary ministry we wouldn’t be losing so many of our children. Fortunately, my steadfast rule of writing is to simply write at least five minutes a day. Anything more is gravy. I’ve written two books in two years that way and I’m well on my way to publishing my third. Jesus makes everything possible! Answer: I drink an enormous amount of coffee. I developed a physical medical need for java back in college and now that I have four kids, I really can’t afford to cut back now. Fortunately, I love coffee. I can even tell you how to make the perfect pot of coffee. First, grab a bag of Starbuck’s Sumatran whole bean coffee and a grinder. Don’t bother with Decaf. Decaffeinated coffee is like a bunny with no tail; there’s just something so wrong about it. Pour 10 cups of water into your coffee maker. Heap the grinder with beans. What I mean by this is that you will fill your grinder until a mound forms over the top rim. Than you’ll put the lid on your grinder and grind for about 15-20 seconds. You’ll hear a difference in sound once the grinder’s done its work. Put the grounds in your filter, turn the pot on and wait for perfection in a cup. Warning: my biker mom can only handle about a half a cup before she hits the road [though I slice off about 2 1/2 pots a day], so you may want to ease into the habit. You’ll want cream and not the low-fat stuff. Just sayin’. Now you’re ready to write stuff. It might not be good stuff, but you’re ready… and editing comes later, my friend. Answer: When you self-publish, folks just kind of automatically assume that you’re this lone gun maverick. Nothing could be further from the truth. I have a lot of guys and gals to thank in the Acknowledgments of my books. I’ve had the great blessing of honest friends. One of them recommended a copy of Browne and King’s Self-Editing for Fiction Writers. That’s honestly one of the most concise and useful resources on the subject that I’ve ever run across. After I write my first draft, I take my book through the paces with Browne & King, chapter by chapter. Once I have my final draft, I send it off to my volunteer Beta reader team, who help me catch any leftover errors. There’s usually not a whole lot; God has given me the spiritual gift of SpellCheck. The Beta readers also give me feedback on what works and what doesn’t. I also get a lot of advice and suggestions from writer’s groups on Facebook. As far as my book covers go, I’ve designed both of mine. Johnny Came Home combined photography and pen and ink. 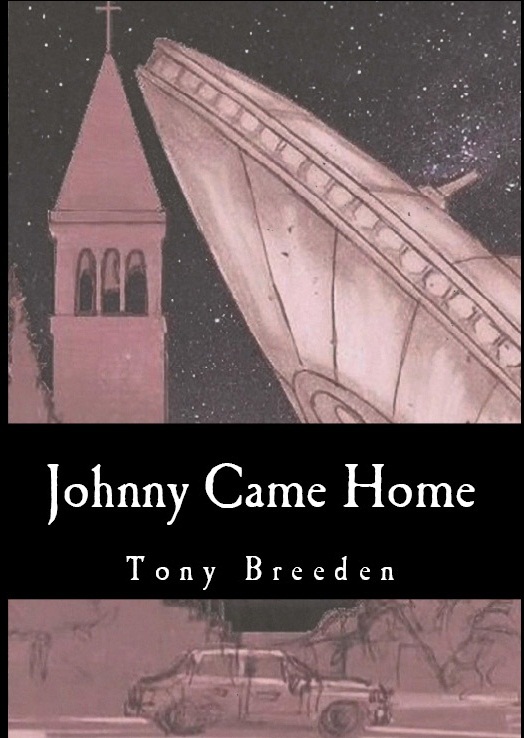 I had the image of a crashed flying saucer parked just under the cross of a church steeple almost from the moment I conceived of the book. That scene actually takes place in the book, though I rendered it as a night scene for creative reasons. The church I based my design off is All Soul’s Church, the church from the set of the Andy Griffith Show. I didn’t actually know the name of that church until after the book was written, but I found it weird that the name I had picked for the church in the book is Soul’s Harbor. Luckbane’s cover was a different matter entirely, a massive colored pen and ink work that depicted a scene from the book that I think captures both the hero’s incredible lack of luck and his unwillingness to give up even in hopeless circumstances. Dragons and dinosaurs are my favorite subjects to draw. If you look closely at the cover you’ll also see the skull of a Triceratops and a Dracorex Hogwartsia. “Meet Jarrod Seventhborn, or Luckbane, as most people in the universe know him. Jarrod is a lowly janitor in a futuristic world that feels like a mix between Total Recall (updated version), The Running Man, and Minority Report. He’s also one of the world’s best players of Impworld, a role-playing game that has captured the attention of viewers everywhere. 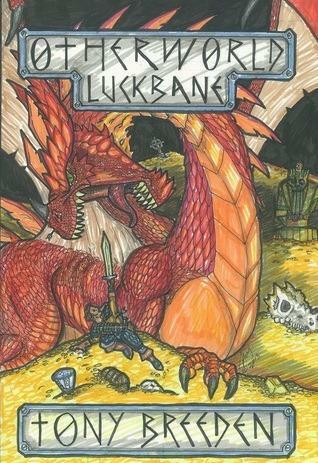 It’s the ultimate reality show, and billions have tuned in to watch Luckbane, who is a thief in the game, conquer every quest and beat seemingly impossible odds. The world is run by mega-corporations, and Jarrod is too popular for his own good. Those in power apparently don’t like it when the common man gives hope to so many. While Jarrod must play with his head on the proverbial swivel to avoid being taken out by a fame-seeking player, he doesn’t realize that he’s made powerful enemies in the real world. Through a series of events, Jarrod is invited to take part in a real-world version of Impworld called Otherworld. He is whisked away to another planet that has been constructed to look just like the game he knows so well. Thanks to futuristic technology, the world is complete with all of the monsters, characters, spells, weapons, armor, and intrigue from the game, as well as several other surprises. If you’re having trouble picturing it, think Middle Earth from the Lord of the Rings on steroids. The action leading up to the game was more than sufficient, but from the moment Luckbane steps into Otherworld, the action amps up to hyper-speed. Most participants in the game choose to play as an avatar, so the person can safely play via remote control. However, Jarrod joins a team of Champions who, for the most part, are content to play in person, meaning if they die in the game, they actually die. Science fiction is the thinking man’s genre. The success of the Left Behind series demonstrated how influential exploratory fiction can be in shaping and reinforcing beliefs concerning eschatology. I realized that apologetics fiction could do the same for evangelical convictions concerning our origins. With that in mind, I set out to tell a great sci-fi story that gives a plausible young earth creationist explanation of comic book super powers rather than the prevalent evolutionary assumption of beneficial mutations, popularized in the X-Men movies and on TV shows like Heroes. The result was Johnny Came Home. I owe a great debt to Frank Peretti and CS Lewis, who showed us that we could tell great stories, deal with doubts and questions, and encourage others in their Christian faith at the same time. Exploratory fiction also gives Christians a voice into the future that we’ve largely left to those antagonistic to the faith. 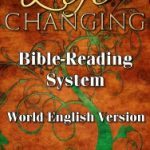 Science fiction is often either hostile or ambivalent to Christianity because we let folks with other worldviews dominate the genre and imagineer the future for us – and as a result many folks feel that in some way religion will become increasingly irrelevant! I have no idea how we let it come to this, but thankfully there a lot of great Christian writers who are changing that. Folks like Tim Chaffey, Joe Westbrook, Robert Mullins, Allan Reini, and so many others besides myself are creating worlds where we can explore answers to the problems Christianity might face in the future and how the church will look if Christ delays a few more centuries [or more]. I’m excited to be a part of this growing movement of “literary apologists” [to borrow fellow author JC Lamont’s term]. Question: What’s the worst trouble you ever had with getting a book written (plots, finding needed information, getting a cover done)? Answer: During one of the final edits of Johnny Came Home, I realized that I had a character that was just cluttering up my plot lines. It was difficult to write Dr. Michelle Phineas out of the story because she was interesting. She was a Titan employee out to capture John Lazarus for the company’s chief rival, Parasol Limited; she had a Mothman-related fear of bridges, having seen the Silver Bridge of Point Pleasant, WV fall; and she had an assistant who had no idea she was about to betray the company. Better still, I had a lot of dialogue that explored creation, evolution and racism invested in conversations between her and the pastor of Soul’s Harbor. The problem was that she and Gage Harper [who was her assistant in the original version] spend most of the novel pointlessly chasing after Johnny with no real clue how they’re going to catch him until Parasol actually does the job for her and let’s her tag along. I cried when I wrote her death scene. Nevertheless I wrote her out with a deep sigh of regret. Then I lovingly patched my novel back together, filling in plot holes and giving any essential dialogue or actions she performed to other characters. But she wouldn’t die! Every time I thought I’d completely erased her, I would find an out-of-place “she” that once belonged to her. Despite liberal use of the Find feature, an actual “Dr. Phineas” managed cling tenaciously to the first edition. By the second edition, she was gone. I ran into a similar problem when I was editing Luckbane, but I chose a different solution. 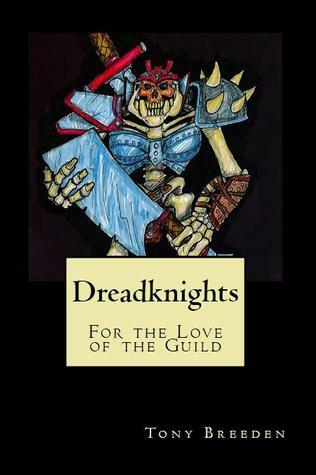 Basically, I cut out all of the scenes involving a guild called the Dreadknights of Outland and compiled and edited them into a companion novelette that I released as Dreadknights: For the Love of the Guild. I even included an appendix that clarifies where each scene fits into Luckbane. Reviewer response to the novelette has been positive and I’ve received some feedback asking for more novelettes about other minor characters, so I think it was a good solution. I only wish I’d thought of that with Johnny Came Home. Answer: My next project is an action-packed three-book hydra of a sequel to Luckbane, carrying Jarrod Seventhborn and the other Champions into the dungeons of the Accursed City of Mot Hadrall and beyond. Soulbright will pick up the tale from the point of view of anti-hero vampyre slayer Copernicus Gallows as Copper faces orcs, vampyres, lycanthropes [think: werewolves, were-scorpions, werebats, etc], medusans, the living dead, and his own dark heart on his quest to find the next piece of an artifact that has the power to end his most powerful foe: Impunus, the brat prince of vampyres. Heart of Stone will follow quickly thereafter with a tale of Razor Hawkins, a mouthy Freeborn colonist who managed to force his way into the Game by luck and skill, as this gutter mage seeks to escape the forces of the Gnome King and the treacherous Temple of Heretics with his life, soul and sanity intact. The Mind’s Eye, the final book in the 3-part sequel, picks up the story of Jarrod Seventhborn as he attempts to track down the skull of Faustilus the Condemned and keep the dread Firelord and his Infernal armies from obtaining another clue to the location of the most powerful artifact in the Game. Answer: In addition to the three-part sequel to Luckbane, I’m writing John Lazarus: Mann from Midwich, the sequel to Johnny Came Home. I’m also contributing to the Worlds of Faith anthology, edited by Paul Taylor. All of the short stories featured will be examples of Apologetics Fiction – defending the Christian faith, by means of well told and interesting stories. Worlds of Faith is slated for publication within the next few months. Lastly, I’ve promised my children that I will complete an illustrated children’s book for them called The T-Rex and the Fuzzy Bunnies: A Bedtime Story for Boys. Answer: My boys are the inspiration for a lot of the things I write. For example, one of my kids made a Mr. PotatoHead that was all hands [we had soooo many sets of this particular toy at this point in his life], except for two eyes. The moment I saw it, I was inspired. In my mind, it was something like Slimer from the Ghostbusters, floating along in the air, stealing things with its many extendable hands and retracting said objects into the safety of its interior. Of course, it had no mouth, so it had to absorb rather than eat these stolen items. Thus, the pilfer was born. …and would have been lost had I not had the foresight to sketch the creature out with a brief description and file it away for future use. The pilfer will appear in an unforgettable chapter of the forthcoming Luckbane sequel, The Mind’s Eye. Likewise, I was watching my personal pack of winged ninja monkeys swordfight through my house [OK, I was in on it, too] and my youngest son, Barbarian Boy, picks up a plush spiked club [you should totally get one of these if you have boys] and throws it at me. “Aha!” says I. “Now I’ve got your weapon. What are you gonna do now?” He answers by picking up a plush alligator by the tail and swinging it at me! Wha-at? I decided right then and there that one of my characters or perhaps one of their foes should have an alligator club… and it should be alive and snapping the entire time! Only an ogre is dumb enough, tough enough and mean enough [no offense to Barry Gordy’s Shonuff] to wield an alligator as a weapon, so I gave it to one of my book’s minor characters, Grundy the Ogre. If you’ve read Luckbane, I guarantee you remember that scene. “Sorry? You’re sorry? Oh, I think we’re well beyond sorry here. Sorry is I accidentally stepped on your foot. Sorry is I was late picking you up from school but I’ll make it up to you.” His expression turned dark. “You let your redneck daddy duct tape me to a chair!” He roared, struggling against his bonds. Question: What is your writing style? Answer: I write cinematically. That means I write as if I’m storyboarding a movie. I’m an illustrator so storyboarding comes as second nature. I do most of it in my head, but some of the action and fight scenes require me to sketch out something more. I think it shows. A lot of reviewers have commented that they have no trouble visualizing what I’m writing, so I’m managing to accomplish what I’ve set out to do. Another thing I use is Robinson and Mungovan’s Screenplay Workbook: The Writing Before the Writing. The worksheets they provide have helped me tremendously with character development, character arcs and story arcs. I’m a big fan of the 12 Dramatic Steps and I try to include them in my novels. Who knows? Maybe my writing style will result in a ready-made movie someday. A man can dream!